A South African court has criticised the government for letting Sudan's President Omar al-Bashir leave the country despite an International Criminal Court arrest warrant. The court asked the public prosecutor to investigate if the government had broken the law. 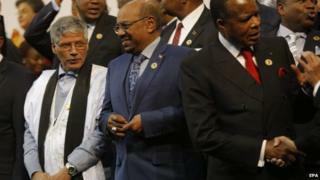 Mr Bashir denies the ICC charge he committed war crimes in Darfur. A court had ordered him to stay in South Africa while it ruled whether he could be arrested. He had gone to South Africa for an African Union summit and the government argued he enjoyed diplomatic immunity. He left the summit early, before the court could rule on this issue. The BBC's Nomsa Maseko in Pretoria says that Judge Dunstan Mlambo suggested there was reason to believe that the South African government had committed a crime by ignoring the court order. How was it possible that President al-Bashir would, with his whole entourage, travel to the airbase without the respondents knowledge? How was it possible that the Sudanese plane would take off from the airbase without the respondents knowing whether President Bashir was on board? How would that plane be able to land in Sudan by late afternoon if it had not departed at about noon that same day? He gave the government 24 hours to explain why and how Mr Bashir was allowed to leave the country. The judge explained that the wider consequences could be huge - saying the state cannot function if it ignores court orders. "If the state... does not abide by court orders, the democratic edifice will crumble stone-by-stone until it collapses," he said. When Judge Mlambo said a democratic state can not function when the government does not uphold court decisions, he was speaking to the cabinet, especially President Jacob Zuma. The judge was very firm against the government's decision to allow Mr Bashir to fly out of South Africa in violation of a court order. But even with those strong words, it does not sound like the newly-appointed head of the National Prosecuting Authority, Shaun Abrahams, is obliged to press criminal charges. Mr Abrahams was appointed just a week ago by Mr Zuma, whose government is implicated in this case. Senior members of the governing African National Congress reacted with vitriolic attacks on the judiciary during a snap debate in parliament. So the chances of delivering a successful prosecution in this case are incredibly slim, if at all. Judge Mlambo ruled that President Bashir did not have immunity while attending the AU summit. He said that South Africa had disregarded international law in order to preserve relations with the AU. Previously, the AU has urged member states not to cooperate with the ICC, accusing it of bias against Africa. Where can Omar al-Bashir go now? Mr Bashir is accused of arming pro-government Arab militias who targeted black African villages after rebels took up arms in Sudan's western Darfur region. The UN says that about 300,000 people in Sudan have died since fighting began in 2003. More than 1.4 million people are thought to have fled their homes. The government says these numbers have been exaggerated. Where can Bashir go now?